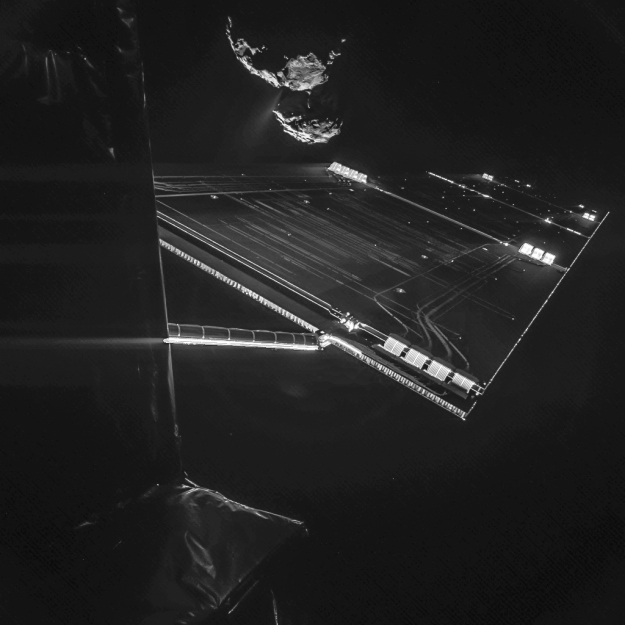 Using the CIVA camera on Rosetta's Philae lander, the spacecraft have snapped a 'selfie' at comet 67P/Churyumov-Gerasimenko from a distance of about 16 km from the surface of the comet. The image was taken on 7 October and captures the side of the Rosetta spacecraft and one of Rosetta's 14 m-long solar wings, with 67P/C-G in the background. Two images with different exposure times were combined to bring out the faint details in this very high contrast situation. The active 'neck' region of 67P/C-G is clearly visible, with streams of dust and gas extending away from the comet.